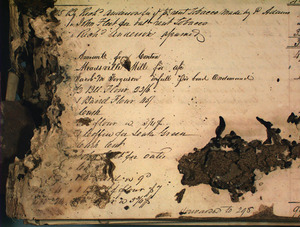 This ledger used to contain the records of a general merchant with a store located somewhere near Lynchburg, Va. It has since contained other things. One of the functions of our staff is to arrange manuscript collections. These collections sometimes come to us in a very primitive state, in disarray and even filth. When the Perrow Papers were originally worked on, we found a surprise visitor, the Lizard. This Lizard had long since expired, but discovering him did elicit some excitement. As a testimony to his love of documents, he now maintains a permanent residence in our collections. T.S. Eliot, “Salutation” (later part II of Ash-Wednesday), Criterion, 7 (January, 1928), 31-32. 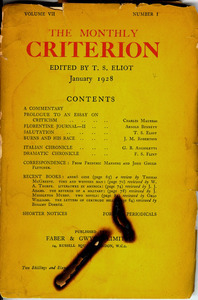 Eliot was editor, as well as a frequent contributor to the Criterion. 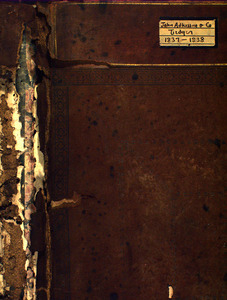 The cigarette burn has scorched pages almost as far as the poem on page 31.